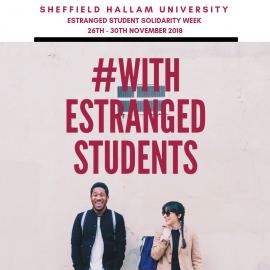 Estranged Student Solidarity Week: 26 – 30th November 2018 is a joint Stand Alone and NUS campaign to raise awareness about family estrangement, and the many barriers to success that estranged students face in Higher Education. Estranged students are young people studying without the support and approval of a family network. Not everyone who comes to university has the support of their family. There are many reasons why people become separated from family; we understand that these reasons are personal to the individual. We also realise that coming to university as an independent student might bring additional challenges, financially, practically and emotionally. Whatever your circumstances, we would like to reassure you that at Sheffield Hallam you don’t need to be on your own. If you would like to talk to someone about how to access support should you wish, please get in touch with our named contacts at transitions@shu.ac.uk or tel: 0114 2252184. There is also loads of useful information on the Stand Alone website including a guide to supporting estranged students applying for independent status from Student Finance.